Rue my mom the day I tasted this. i cannot remember exactly if it was when I tried Pixie’s bangus, or when we were swimming in Pangasinan. But a stuffed milkfish will forever be one of my favorite preparations for this fish. But mom hates it. With gusto. And since I handle most of the kitchen preparations when I’m home, yeah, she is bound to not eat fish one of these days, and it has come. I saw some filleted bangus, still whole (when I say fillet, they removed all of the bones, but kept the fish whole) in the freezer and decided it was time to do this! I asked our helper to pull out some lemongrass from the neighbor (we asked permission), and I chopped some onion and tomatoes, and then sliced some ginger. The fish was marinated in calamansi, then seasoned with salt, and coated inside and out with oil. Then lemongrass, mixture of tomatoes and onion and ginger, were slathered in the fish. The fat fish was folded, wrapped in parchment paper, then wrapped in foil. On my cast iron skillet, I placed the firsh and covered this. I left the fire on high for frive minutes and then on low fire vor the next 15 minutes. I flipped this, and did the same. After the 20 minutes, I removed the foil to let the fish cook more, but there was no need actually since the fish was already browned. But just to be safe, I still did 5 minutes on each side sans the foil. On the last turn, I added some halved tomatoes, oiled and salted, into the pan, and grilled these as well.I then removed everything, and placed it on a plate. 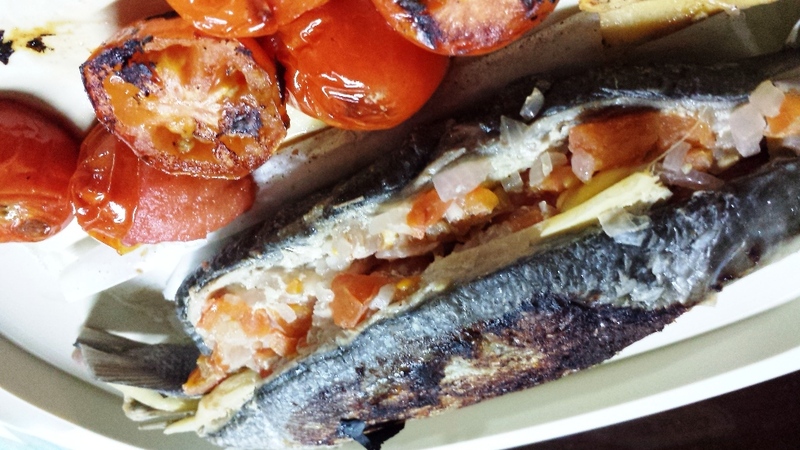 Marinate the milkfish with the calamans, while preparing the onion, tomatoes and ginger. Mince the onion, dice the tomatoes, slice the ginger, clean and pound the lemon grass roots. Oil the fish inside and outside, then season generously with salt and pepper. Stuff with the tomato mixture and fold over to close. Wrap in parchment, then wrap in foil. IN a hot grill or cast iron pan, place the foiled fish and cook for 20 minutes over low heat, with the first 5 minutes on high. Flip and do the same. 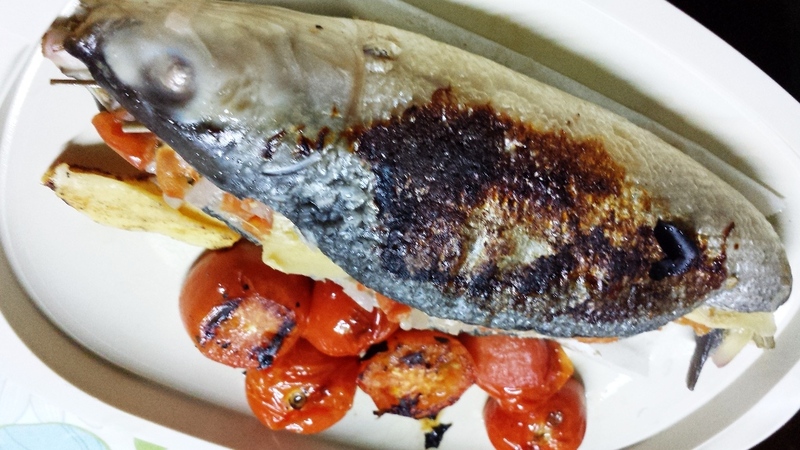 Remove the foil and add some charring to the fish. Grill the tomatoes as well until soft.